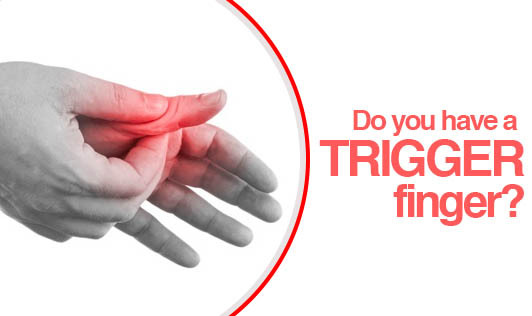 Do you have a Trigger finger? Trigger finger, also known as stenosing tenosynovitis, occurs when one of your fingers or your thumb gets stuck in a bent position. It is difficult to straighten it without pulling on it by the other hand. The trigger finger can be severe; may become locked in a bent position, and can often be painful. It is caused by a narrowing of the sheath that surrounds the tendon in the affected finger. Those who require repetitive gripping actions are more susceptible and it is also more common in women and in people who have diabetes. Most cases occur for no apparent reason in healthy people. Sometimes, the trigger finger is more common in people with Rheumatoid arthritis, Carpal tunnel syndrome, Amyloidosis and in people on dialysis. If you're finger joint is hot or inflamed, see your doctor immediately for a physical evaluation of your hand!